Reagan Campbell-Gillard, right, will miss Origin II and potentially the last game of the series. NSW prop Reagan Campbell-Gillard is out of next Sunday's second State of Origin match at ANZ Stadium after suffering a serious jaw injury in Penrith's 32-6 loss to the Sydney Roosters on Friday night. The 24-year-old left the field during the first half and did not return after copping the shoulder of Jared Waerea-Hargreaves in a legal hit. Penrith general manager Phil Gould tweeted the bad news on Saturday morning, giving Blues coach Brad Fittler some food for thought ahead of the naming of the team for game two. "Confirmed Reagan Campbell-Gillard has sustained an undisplaced fracture of the mandible. He will see a surgeon this week. Best case scenario 4-6 weeks. Bad luck for Reg, but could've been worse," Gould tweeted. 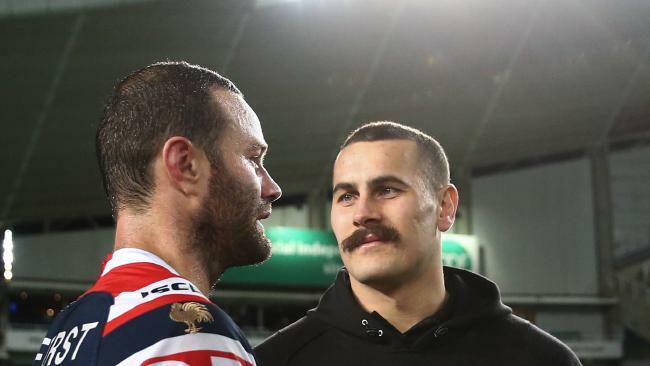 Ryan James, Aaron Woods and Trent Merrin would be the favourites to replace Campbell-Gillard, and Tariq Sims would be an outside chance if Fittler instituted a pack reshuffle. Campbell-Gillard's injury was just one in what turned into a dramatic Friday night of NRL action. Blues teammate Latrell Mitchell injured his neck in the same game, but there are hopes he may be stiff for only a couple of days. Five-eighth James Maloney was also limping, but claimed after the game it was a sciatic nerve and it wouldn't be a long-term problem. Meanwhile, Queensland also copped problems in the form of Michael Morgan (bicep) and Dylan Napa (ankle), while hopeful veteran Matt Scott didn't play for North Queensland.